Lamp and Light Fixture Inspections: Is it Safe? With all the Restoration, Repurpose and Reclamation programs on TV, its easy to get inspired to pick up an old fixture and bring it home. However, buying used fixtures/lamps that appear to be working correctly might still have hidden problems. 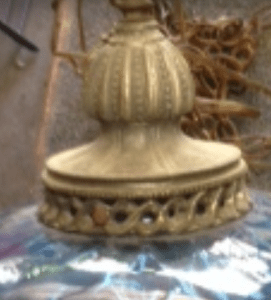 I thought it might be a good idea to devote an article to inspecting a lamp/light fixture. As with any of my projects, safety is number 1, and with any electrical appliance, lamp or light fixture, insuring it remains compliant with the electric code and the original UL listing is very important. We recently picked up the swag lamp pictured to the side. The picture is from the location we bought it. As you can see it was working. So why would I want to take it apart? Just to check it out! So, I disassembled it to clean, inspect, repaint the metal surfaces and total rewire if required. As with most any hanging type fixture with the bulb below the socket, there is a natural tendency for the rising heat to make an impact on the above wiring. As expected, I found brittle and decayed wiring above the socket. After seeing the condition of the wiring I wondered why the fixture was working at all! Overheated wiring is the sleeping giant of lamp and light problems. Most wiring is rated at 105C (or 221F), and in most correct applications will be fine, however when a bulb wattage is greater than the lamp rating is used, the wiring will be the first component to suffer. You may never know it until the wiring is disturbed. Once disturbed, the insulation can disintegrate and potentially cause the wires to touch each other. You know where the story goes from here. Always follow the bulb ratings requirements as listed on the fixture. Physical Review of the Lamp: Is it relatively clean, does it appear to have been stored inside or outside? 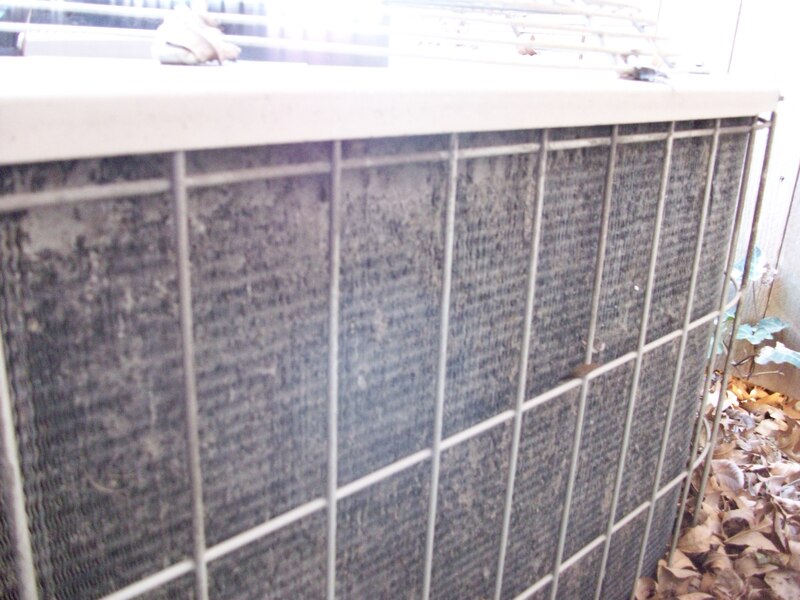 Fixtures left outside can rust as well as rodents can get to places unseen to chew on the plastic wire insulation. 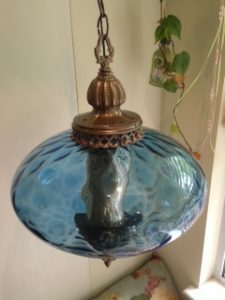 Manufactured or Custom: In general, lamps that were manufactured in mass generally were designed and built to a specification. Typically they use standard lamp parts and overall meet the design criteria necessary for long term use. 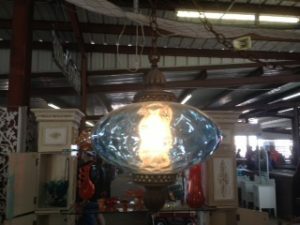 Custom lamps can be made from most anything (bowling balls, table legs, vases, etc.). Good custom manufacturers follow the same criteria. On the other hand, I regularly run across lamps that were hand built, but failed to ensure proper safety for long term usage. Many of them I can fix, but for various reasons a bad design can cause premature failure, in turn, it may not be a good lamp. The two most important items with custom lamps is 1)quality of workmanship and 2) proper heat dissipation. Wiring terminations: Most failed wiring is at the terminations. 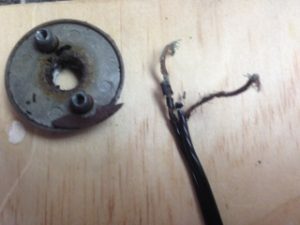 Frayed/broken wires, premature insulation failure, loose connection can all impact the safety and performance of the light. In this picture the bottom wire has decayed insulation and has turned black in color due to excessive heat. The one on top is in good condition. Polarity: In a simply lighting circuit there is a “line or hot” side and a “neutral”. Those terminations should be consistent from the plug to the socket to ensure the hot termination is in the base of the socket not the shell. This is tested with a VOM meter. Polarized Plug: Similar to #4. The larger prong on the plug goes in the larger hole in the wall socket, which is the neutral side, maintaining the polarity through the entire circuit. If it is a lamp and has a plug on the cord and it is not polarized, it is a good idea to change it out. Wiring Size: Not usually a problem with US manufactured lights, but most lamps/lights originally designed to work in a different country could have undersized wiring for use in the US. 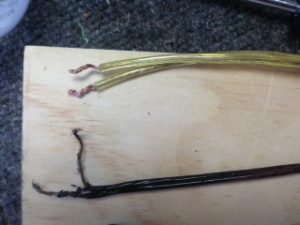 After determining the wire gauge, this can be addressed in multiple ways including, 1)rewiring the lamp or 2)simply lowering the wattage of the light bulb to be used. Bulb Sockets: Sockets show wear for various reasons, including the cardboard insulator and the metal contact surfaces. Regardless of the reason; noticeable wear in the socket should be resolved by replacing it. Grounding circuit: Lamps have polarized plugs, but light fixtures require a grounding circuit. This could be a green wire, or a small bare wire, or even a black wire with green tape that is attached to the body of the light fixture. With a VOM meter, continuity between the conductor and the bare metal surface of the fixture can be confirmed. Switches: Most switches tell you when they are bad and there is little indication they are going bad; not a lot of in-between. They can be good today, and bad tomorrow. If you have taken the lamp apart, changing the switch/socket is cheap insurance. Dimmers: Many times dimmers start to act up before total failure. Inspect for 1)free movement between clicks, 2)ambient temperature to touch, 3) full range of light from the bottom to the top of the dimmer movement. If it is just dead, some large dimmers have internal fuses that can go open. Physical Integrity: Most all manufactured lamps include metal parts. Many of them are soft metals such as brass or pot metal which can be fairly easy to bend or break. With that said it is not uncommon to have to occasionally tighten up some of the parts to keep everything in alignment. Do not over tighten the parts, the soft metal can break and be difficult to repair. FYI: Pot metal can be difficult to fix, so if you are thinking of buying a lamp that is physically broken, you might think twice. Ventilation: As you can see in this picture of the top cap of the same swag lamp; there is virtually no ventilation for the heat to escape. Just for safety sake, I added some ventilation holes in the top cover. Light it up: The final test is to power it up and let if run. Depending on the type of lamp, I may let them run for 30 minutes or so with the highest rated bulb. Mainly looking for heat problems with components and if it smells. 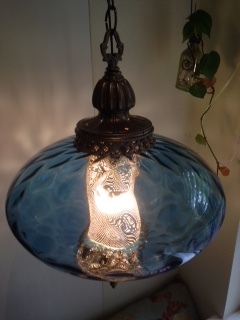 Here is the finished lamp. You can see the small holes I added to the top section for heat dissipation. Since heat is a major issue in this style fixture, I used an LED bulb and it drastically cut down the amount of heat. LED bulbs have become a game changer for multiple reasons; look for a later post on LED bulbs. Yes, that is me in the bee suit. 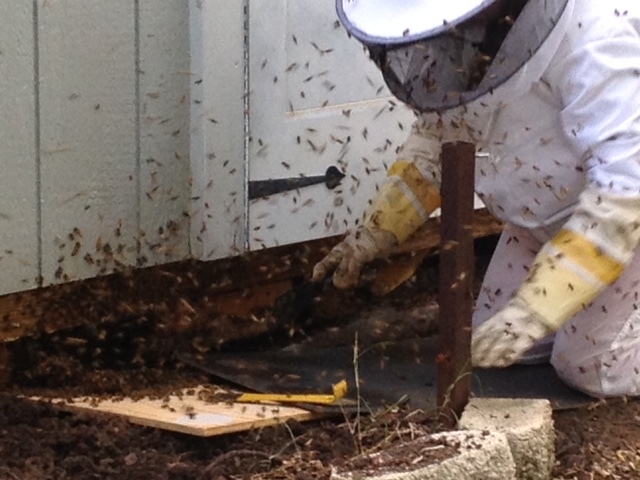 Spring is not a great time to do bee remediation, but you will find them swarming this time of year. Yes I knew they were there and had decided to let them do their thing, but the situation changed and I had to ask them to leave. They were not happy with my request. We did our best to save the hive. I attempted to relocated about 20k bees that were under my shed the spring of 2015. The picture was a reminder to me to re inspect the shed. The good news is they have found a new home somewhere. I have not seen them this spring. If you are a follower of this blog, lawn sprinklers seems to be a regular topic. I get more hits on this one subject than all the rest. After reviewing the current articles I found that I lacked a straight up, “seasonal tune up” article. So, for this weeks post I am going to walk through a methodical process of checking your sprinkler system. Generally speaking this is about a system that is designed correctly and working properly. I typically do this at the beginning of the watering season then again in mid-summer. 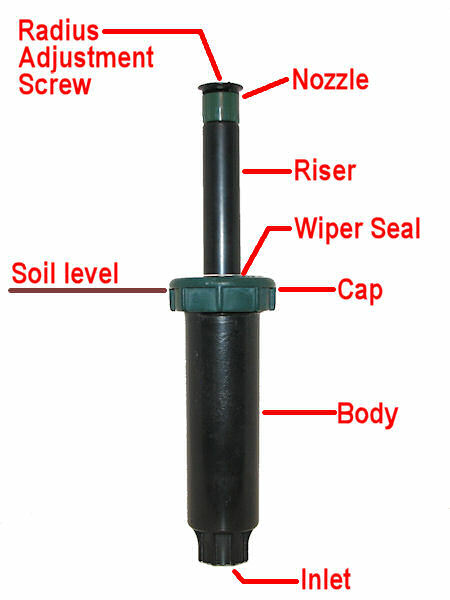 A handful of various sprinkler nozzles: Even though there may be several types of sprinkler heads (pop up, rotary or impact), it is important to have extra copies of the same nozzle that are being used in the various zones. Even though many home centers prefer to sell you the sprinkler body with the nozzle, having them as separate items will save you time and money. Sprinkler flags: You will probably have to buy these in a pack of 100, but it will be less than $10. You will use these to mark sprinkler heads that require attention. Dental tool: Something like this link will work; these can also be found at the Orange Box store. It is very common for sprinkler nozzles to capture small pebbles that will lodge in the nozzle disrupting the sprinkler spray pattern. You will want to pick out the debris without damaging the plastic. WD 40 Lubricant Spray: Used to lubricate various parts that are supposed to move or react to the water pressure. WD40 is a fish oil based product and should not damage the grass. Activate the test sequence in the Sprinkler Controller: Most controllers have a test function that allows you to run the system in short intervals. If you can choose the time limit, set it to two minutes. If your controller does not have this function, you can have a friend turn the sections on one by one. TIP: If you have to do this manually, find some walkie-talkies to communicate with your partner. Its also worth noting that many new controller that connect to your phone via an app, is a great upgrade as you can start and stop without having to run back to the controller. Find the first zone that is running: Carrying your sprinkler flags, walk around and through the zone that is running, looking for the six items mentioned below. Use the flag to identify problems. However, try to realign the heads in this first sequence while the zone is running. Use the Channel Lock to grab the body to make adjustments. Repeat #2 for all the zones: I find the sprinkler flags really help, cause you can go directly back to each problem once you have made it through the entire system. Repair, replace or adjust the heads as required: One of the most important elements of sprinkler repair is to avoid introducing dirty water into the system. The dirt will make its way to all the downstream head and clog them up. If you find a broken head or pipe within your inspection, you may have to clean all the nozzles (see #2 below) in that zone. Run the test sequence again: As a final step, run the system one last time to ensure that everything is operating to your expectations. Misaligned Heads: Heads that are used around the perimeter of a property typically use patterns less than “full circle”. These heads will require occasional realignment to keep them from spraying on a sidewalk, fence or house. You can adjust either the nozzle, neck or sprinkler body. Try adjusting to the right (righty tighty, lefty loosie). If you have to turn it to the left, try not to turn it more than a 1/4 or 1/2 turn. Turning the head too much to the left may cause the nozzle or head to disconnect itself (while under pressure), this may cause a guiser of water and will get you real wet. Dirty Nozzles: If the pattern seems uneven or broken up. The nozzle is dirty. With the water off, grab the sprinkler stem and raise it as if it were spraying water. Use your vise grips to LIGHTLY hold the stem up. Remove the nozzle and pull the filter (with the dental tool or your finger tip). Blow through the filter and nozzle. If this doesn’t remove all the debris, use the dental tools or water to clean further. You may have to disassemble the nozzle completely to get the dirt out. If the filter was completely stopped up, turn the sprinkler zone on/off very quickly to flush the line at this point (with the vice grips in place). Reassemble the nozzle to the head and release the vise grips to let the stem return to the body. NOTE: The purpose of keeping the stem extended through this process is to avoid the opportunity for dirty water to enter the system. Broken/Damaged head: Besides the nozzle mentioned above, the sprinkler body can leak as well. This could be out the bottom, side or top. Sometime the heads can be rebuilt, but at this stage its best to just swap out the head with an identical body and nozzle. If it’s not muddy around the head, attempt to unscrew the complete body out of the ground. Without disturbing the dirt, re-insert the replacement head. If you have to dig it up, use the sharp shooter shovel to expose the head down to where it connects to the next pipe. It’s best to dig the hole a bit deeper than the head. If water comes out, you do not want the dirty water to reenter the system as mentioned above. Replace the head and the surrounding dirt. This sprinkler repair link has a video included that might be of help. 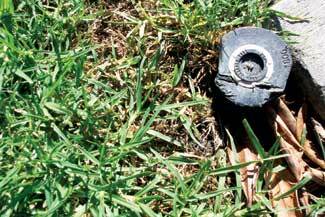 Sprinkler heads do not recess into the ground after spraying: This is a very common occurrence caused by small dirt particles surrounding the elevated riser at the wiper seal of the sprinkler head after the water is turned off. Grab the head by the tip and spray WD-40 on the riser. Work the shaft until it moves freely. If that doesn’t clear it, replace the head and rebuild the old one in the sink to get all the dirt out of it. 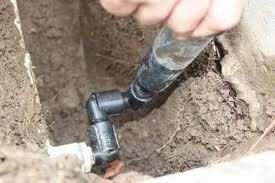 Heavy Running or Pooling Water: This could be associated with #3 or it could be a damaged pipe. With your shovel, LIGHTLY remove the wet dirt, you do not want to cause anymore damage. Dig below the pipe or area to be repaired. Use a coffee can to remove as much of the water and dirt as possible. Make the repair as necessary. Weeping heads: Occurs when system is off. Typically you will notice this on days the sprinklers are not running, or you find constant moist spots. Typically, you must disassemble the sprinkler valve and clean it. Rebuilding the valve may be required as well. Draining sprinkler head: similar to #6, but usually happens with a head that is located lower that other heads in the zone. This is fairly normal and can be left alone. If it happens in a bad spot and you really don’t like it, you can add a lateral line drain to disperse the water. For more detailed information, take a look at these other articles I have written on the subject: Lawn Sprinkler Efficiency Part II, Lawn Sprinkler Efficiency Part I , Searching for Lawn Sprinkler Valves, Chasing Lawn Sprinkler Leaks; Finding Sprinkler Valves and Common Problems,Lawn Sprinkler Efficiency Upgrades Part II, . You are currently browsing the Homeownerbob's Blog blog archives for April, 2016.